Fairfax County Police say threats directed at certain Fairfax County Public Schools — as well as other school districts in Virginia, Maryland, and elsewhere — are a hoax. The Fairfax County Police Department has determined that online threats of a school shooting that appear to be directed at several FCPS schools are a hoax and not credible. The parents at those FCPS schools listed in the online messages have been notified. These same messages have also been directed at other school districts in Virginia, Maryland, and elsewhere. 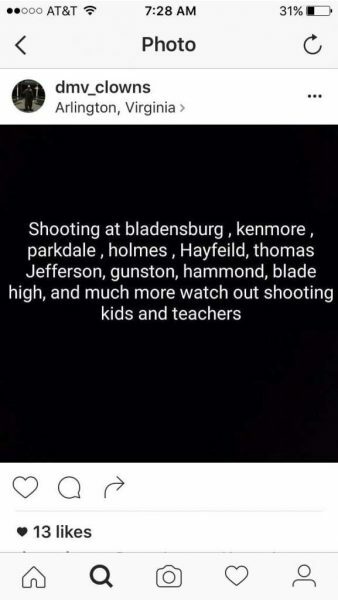 The “Virginia Clowns” social media account last night (@virginiaclowns and @dmv_clowns) posted threats, echoing a nationwide trend, warning of shootings at a number of DC- area schools. 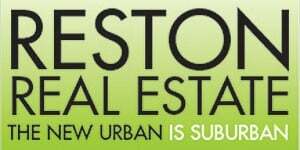 None of the schools threatened by the accounts are in Reston. 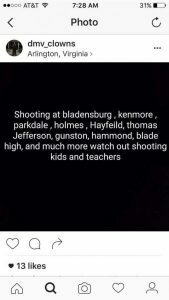 The “clowns” mentioned Hayfield High School, Gunston Middle, Holmes Middle and Thomas Jefferson High. The Fairfax County Police Department has determined that online threats that appear to be directed at several FCPS schools are a hoax and not credible. The parents at those FCPS schools listed in the online messages have been notified. These same messages have also been directed at other school districts in Virginia, Maryland, and elsewhere. The safety of our students and staff is our highest priority. In addition, we believe that, as partners in your child’s education, we have a responsibility to inform you of these kinds of circumstances, even when there is no reason for alarm. Although all threats are taken seriously, this incident was clearly intended only to disrupt school operations and we do not believe any of our students are at risk. With the assistance of our law enforcement partners, we will continue to be diligent to ensure the safety of students and staff. Thank you for your support and understanding.